This article is about the Daedric Prince. For the cat, see Azura (cat). Azura is the Daedric Prince of Dawn and Dusk. She communicates with you multiple times throughout the game, either by possessing somebody or speaking through one of her statues. 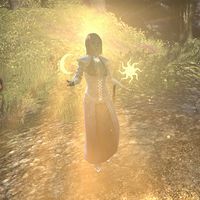 She appears phsyically in Seyda Neen during the quest Divine Conundrum by possessing the body of Tanisa Drothan, and then again in Ald'ruhn and Vivec City by possessing an Ashlander named Seryn during the quests Divine Delusions and Divine Restoration. She asks for your help in freeing the soul of one of her servants, Culanwe, from eternal torment by Molag Bal and in freeing her Oracles from pocket realms of Oblivion. 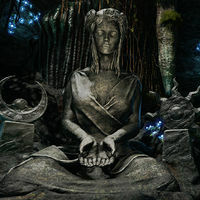 In the Morrowind chapter, Azura plays a vital role in stopping Clavicus Vile's plan to use Vivec's divine energy to open a portal to the Clockwork City, as the success of that plan would have resulted in the destruction of Vvardenfell. Azura's Aid: Cleanse the Shrine of Azura and pray for guidance. Azura's Relics: Help recover stolen relics from Daedric worshippers. Divine Conundrum: Help a canon fulfill a mission from Vivec. Divine Delusions: Discredit an Ashlander's claim to the title of Nerevarine. Divine Restoration: Seek guidance from the Lady of Twilight against a common foe. Eyes of Azura: Rescue a priestess from the hands of Molag Bal. The Missing Prophecy: Rescue the Oracles of Azura from their Daedric prisons. The Return of the Dream Shard: Return the stolen Dream Shard to Pariah Abbey. When the Dream Shard is returned to Azura's Shrine in Pariah Abbey. Voice of Azura:"Thank you, mortal. I had my doubts, but it seems the Abbot's faith in you was well-placed. I will watch you more closely from now on." Azura will speak several times during Azura Aid. Voice of Azura:"Excellent. You have the stone. Proceed, mortal, and come to my shrine." Voice of Azura:"Yes. This dust will return the light to my shrine. Bring this and the stone when you come to my shrine." Voice of Azura:"Follow the lights up to my shrine. Smite Vaermina's foolish servants as you come." Voice of Azura:"This was once a glorious shrine, but time and these fools have befouled it. Come. Cleanse the shrine and we shall speak." "You've done well, mortal. You returned my Dream Shard, you vanquished Vaermina's Omens, and now you've cleansed my shrine as well. But the Mistress of Nightmares has not yet released Stormhaven from her clutches, has she?" No. She now targets High King Emeric. "Indeed, and King Emeric has been very tolerant toward my Spirit Wardens...a fact I have not failed to notice. First, Vaermina attacks my abbey, then she desecrates my shrine, and now this. If I didn't know better, I might think it was personal." Will you give us assistance in fighting her then? Yes. Vaermina has pushed too far this time, and she must receive her comeuppance. I will aid you, but you should know that extricating your king from her clutches will be far more difficult than it was with the others." What makes this situation different? "This time, she has unleashed her own consort, Galthis——the Night Terror. He consumes King Emeric's mind in the nightmare, blocking your entry. I will give you a Duskstone to penetrate the nightmare, but defeating Galthis will be another matter." How do I defeat Galthis? "You've proven to be talented and resourceful so far. Let this be another test of your strength. I'm sure you'll succeed in serving me faithfully once again. Go now, mortal. Go save your king...and teach Vaermina to keep her hands off what's mine." "Due to an ancient pact, I am not permitted to interfere in the affairs of Nirn. Even this casual discussion pushes the boundaries of that agreement. Instead, I must work through trusted agents, such as yourself and Seryn." "Helping that arrogant imposter? Whatever gave you the idea that I was helping that murderer? Vvardenfell must stand. Everything I do in this regard serves that single goal. Best that you remember that, Mortal." This page was last modified on 3 August 2018, at 01:09.